Inquiries for further information and/or rental fees for the facilities described below should be directed to the Municipal office. The cement ice pads can also be rented for hosting outdoor events during the warmer weather, such as BBQs, family reunions, concerts etc. Contact the Municipal Office to pay the fee for a fitness membership, or pay the daily rate when you drop in. The first white settler arrived in Shebahonaning, now known as the village of Killarney, in June 1820, to establish a fur trade post for the Northwest Fur Company. The Killarney Centennial Museum opened in 1967 and traces our history from the time of the fur trade to the present. The old jail house, built in 1886, was the first site of the Killarney Museum. It still stands beside the present log Museum, which is located at 29 Commissioner Street. The Museum was designed and built by local men in 1985. It contains a variety of household items, medical equipment, photographs, and artifacts relating to our commercial fishing, logging, mining, and tourism industries. During the summer, the Museum is normally open from 10 am to 12 noon and 1 pm to 5 pm every day except Tuesday & Wednesday, from July 1st weekend until Labour Day Weekend in September. The Killarney jail house originally contained four cells. The two remaining cells still have their original heavy doors, with a rectangular hole cut in the wall above each doorway for light and ventilation. 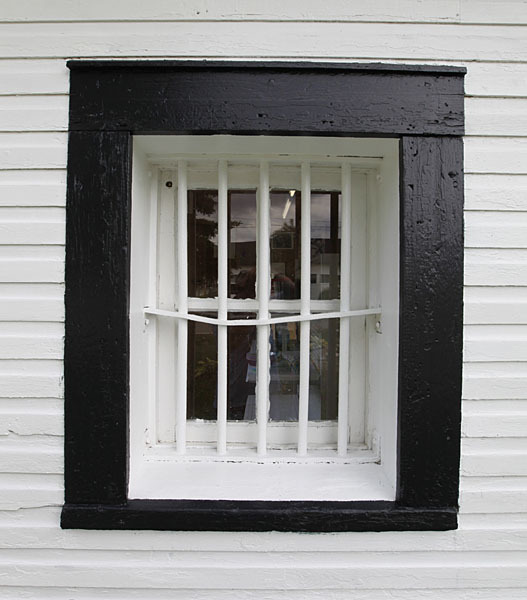 The side windows of the jailhouse have their original bars. For many years, a high board fence surrounded the building, acting as a further security feature, but it was removed some years ago along with two of the cells. Exterior siding was added and the building eventually was also used for meetings of the Town Council. For years, various men of the community served as Town Constable. In 1961, Killarney became accessible by road, and the Ontario Provincial Police established a detachment here soon after. Today, police services are provided through the OPP detachment located in Noelville. In 1967, the Killarney Museum was established in the jail house as part of the community's Centennial project, celebrating the 100th Anniversary of Canada. The building was closed for a number of years until the late 1970s, when the Killarney Community Improvement Association began researching the history of the area and re-opened the jail house as a museum. In 1981 the interior paneling was applied to the main room. The present Museum, located in the log building behind the jail house, was designed and built by local men and opened in 1985. The roof of the jail house was replaced in May 2001.